May 31st 2016 by Scholastic Inc.
Geronimo's latest fantasy novel is due very soon, but he's been procrastinating, and his grandfather doesn't seem to have much faith in his abilities. When his watch is broken in an accident, Geronimo's grandfather suggest he visit an old friend, Minute Mouse, to have it repaired. After a pleasant evening and plenty of cheese, Geronimo falls asleep in a chair at Minute Mouse's house and finds himself transported to the Kingdom of Fantasy. There Blossom, the queen of the Fairies, is aging at a rapid rate. Geronimo must go on a quest to find and fix the enchanted clock. Such a quest is fraught with danger, and Geronimo must deal with the Labyrinth of Illusions, Peaclock the Peacock, the Kingdom of Witches and many other places and creatures before he is able to put the kingdom to right and return Blossom to her former glory. Of course, when he wakes up, he realizes that he has the story for his newest novel. I haven't read the other seven books in this series, but they seem to be a good introduction to fantasy tropes for beginning readers. The story was similar to The Phantom Tollbooth, and just about any kind of magical creature that has ever appeared in prose makes an appearance. 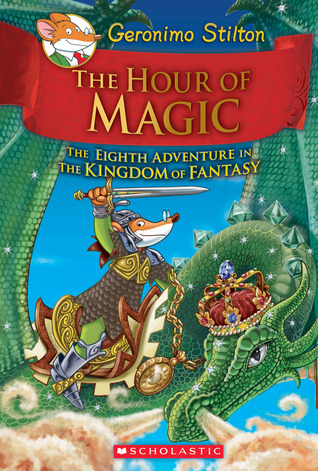 The artwork is as vibrant and amusing as it is in the other Geronimo Stilton books, with evil witches, funny frog princesses, and lots of sparkly things like the Sword of Truth. Occasional two page spreads show more detail of characters or places, and young readers will spend hours poring over different monsters and kingdoms. It's easy to dismiss the Stilton books as fluff, but I thought this one had a nice message about Geronimo's interactions with his gruff and demanding grandfather. He is able to see how proud his grandfather is of him and this gives him a new understanding of why he is held to such high standards. The Hour of Magic is a perfect read for a wet summer day, as long as it can be accompanied by an appropriately cheesy snack! Since Abby has found out that Maryrose has been cursed, she goes through the mirror to try to help her, although she really should be spending her time trying to get more books under her belt for the school fundraiser read-a-thon. When she and Jonah end up in the world of Aladdin, Abby hopes that she can use her wishes from the genie in the lamp to rescue Maryrose. Unfortunately, she misspeaks her first wish, releasing the genie. 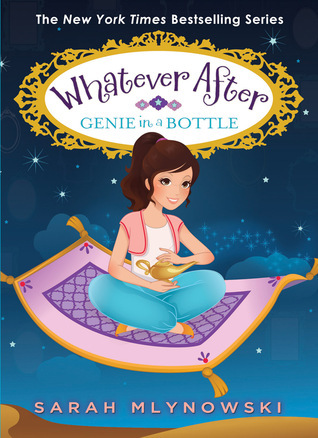 Eventually, she ends up working with a novice genie, Karimah, who isn't very adept at granting wishes. And there are many that need to be made, since Abby finds out that Aladdin has fallen in love at first sight with the princess Badr-al-Badur, who in turns falls in love with him. Her father has given permission for the two to marry, but only if Aladdin can provide jewels and a fancy parade. Can Abby make Aladdin's dreams come true and save Maryrose? While the ages of Aladdin and Badr-al-Badur seem very young, there are some good details about the world of the Arabian Nights. Mlynowski is always good about pointing out the differences between Disney versions of stories and the traditional ones, so it's good to see that the princess isn't named Jasmine. There are descriptions of food, living conditions, and the plight of street children. Badr-al-Badur is very interested in community service, and is not a stereotypical princess, no matter how trite her falling in love at first sight with Aladdin in. To his credit, Aladdin is impressed more with her fine qualities than her beauty. This series appeals to readers who like light fantasy tales such as Buckley's The Fairy Tale Detectives or De Laurentiis' Recipe for Adventure series. They may even pick up this author's The Wishing Day after Abby mentions that she is reading it for the contest! It would be fun to pair these tales with readings of the folk tales or original stories that inspired them. Some of these books are a little odd. The mix of fairy tale world and real world in this seemed off. Was Aladdin wearing tennis shoes and playing soccer in the school yard at one point? And he really fell in love that quickly? And they want to get married? And Aladdin's mother makes outfits for three people overnight? Just struck me as unbelievable and possibly culturally incorrect at some points.